Maanada Mayilada Season 10, a dance show on Kalaignar TV has managed to enter Guinness Book of Records. 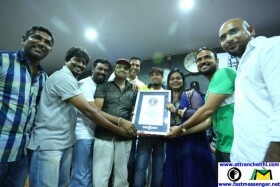 It is the first dance reality show to create such a record. Coming to know about the mammoth set, the officials of Guinness awards came forward to honour us with the accolades, she said. It is a rare achievement and we managed to put a huge set with great difficulties, she said and added, ‘We are proud and happy with the honour’. Speaking about the show, she said, ‘When we started the show I suggested some English names. But it was Kalaignar TV, who suggested the titled Maanada Mayilada. Initially I was hesitant. But now it has become a household name. Wherever I go people especially children sing our song. She said the credit should go to the whole team. They toiled very hard. On being spoofed in several shows in various television channels, Kala, said, ‘ I am happy, because only a VIP would be made fun of. Those who are making fun of me are making their livelihood with that. Making mockery of dancing is like degrading Lord Nataraja’. She concluded saying ‘We have best dancers in the country. The show comes on Kalaignar TV this week’. Among those present on the occasion today included choreographer Kala, members of the dance union and the crew of Maanada Mayilada. The show is directed by Kala and produced by Kalaignar TV.